REYKJAVIK, May 23, 2011 (AFP) - A plume of ash from an erupting volcano in Iceland is being blown south towards Britain and could reach the airspace over mainland Europe later in the week, meteorological experts said on Monday. Two days into its most powerful eruption in over a century, monitors said that ash particles from the Grimsvoetn volcano had been scattered across much of the North Atlantic island whose airspace has been closed since Sunday. 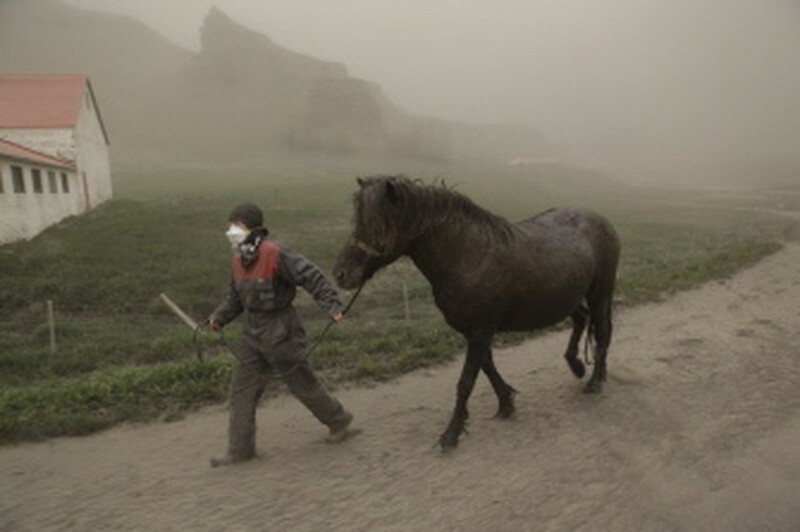 AFP - Anna Hardadottir, a farmer of Horgsland, leads a horse, through the ash pouring out of the erupting Grimsvoetn volcano on May 22, 2011. The eruption of Grimsvoetn has evoked fears of a repeat of last year's travel chaos sparked by the eruption of another Icelandic volcano which led to the biggest shutdown of European airspace since World War II. A spokeswoman for Iceland's airport authority, Isavia, told AFP Monday authorities hoped the main Keflavik airport could be reopened later in the day. "We will know more at noon (1200 GMT) when we get new information on the ash cloud situation," Hjordis Gudmundsdottir said. Most eyes however were turned to warnings that lower-level winds were changing direction and were blowing some of the ash towards Britain and possibly on to mainland Europe. "The higher level winds are blowing towards the northwest," explained Peitur Arason, a forecaster at the Icelandic Meteorological Office, adding that "low-level winds are ... blowing strongly towards the UK." While lower-level winds are close to the ground and thus will probably not manage to carry the ash as far afield, Arason said they would still "affect air travel." Einar Kjartansson, a geophysicist based at the same organisation, meanwhile stressed that predictions that ash would reach mainland Europe later in the week were "just a possibility and it's not guaranteed that it will happen." How far the ash travels will depend on the strength of the winds and the intensity of the eruption, experts agree, pointing out that historically, Grimsvoetn eruptions have tended to have very brief explosive stages, with the intensity usually subsiding significantly within a few days. Kjartansson confirmed that the volcano was still erupting on Monday morning. "Grimsvoetn is still going, although the power of the eruption is less than it was yesterday morning but similar to what it was last night," he told AFP. "The ash has spread a fair amount across the country. There was ash over Reykjavik last night," he added. Arason said Monday the plume of ash, which reached a height of 20 kilometres (12 miles) at the outset, "has been steady at 10 kilometres all night."